Labrador, is believed to have been named after the Labrador Peninsula, a large coastal fishery located in north eastern Canada by one of its early settlers. Labrador is one of the oldest suburbs on the Gold Coast and today has a mix of older and new properties, townhouses and high rise buildings. 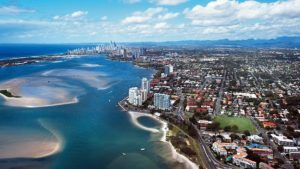 Labrador is located on the edge of the beautiful Gold Coast Broadwater a haven for recreational boating and next to Southport the CBD of the Gold Coast. Charis, a favourite seafood supplier is also situated in Labrador, on the Broadwater’s edge, a favourite supplier for locals and visitors. Daily pelican feedings take place behind Charis Seafoods. We often undertake pre-purchase building and pest inspections in Labrador. We send out two highly experienced and licensed inspectors at the same time and our clients are also most welcome to attend also. We work independently for our clients, unlike Building & Pest Inspections Franchises who have many affiliations with agents, conveyancers and solicitors that they rely upon to refer their services. This always comes at a price and that price means your inspectors are not working for you, they are working in with those who refer their business to you. Being independent of outside influences allows us to protect only your interests when purchasing your Parkwood property. We will not discuss anything from your inspections with agents, property owners or property managers without you giving us prior permission to do so. The information we obtain from your inspection is for you to use at your advantage. View the reviews and comments from our other customers who have purchased properties in Labrador and engaged us to undertake their pre-purchase building and pest inspections for them! I would like to take this opportunity to thank you for placing me on your busy Christmas schedule and am very happy that you have shown such great service through this happy time for us.Peter, thank you for the inspection report! We have decided to move forward on the property and will take all of your advice into consideration.